The WTX WideTracker Tricycle is an adult sized trike that works with the same simple drive system as a classic child's trike. 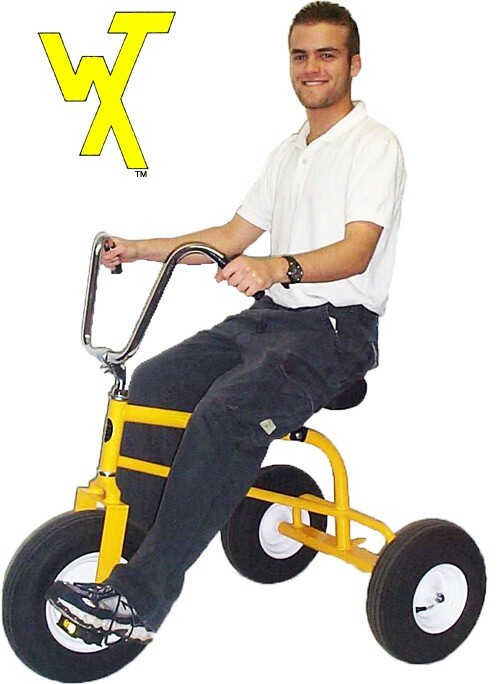 Offering a fun ride for anyone and particularly good for therapeutic purposes, the WTX WideTracker Trike's pedals are directly connected to the front wheel--like a kid's trike--giving the rider complete control over the trike's motion. The pedals turn at all times when the cycle is in motion, and can be used to stop the trike by reverse pedaling. The WTX WideTracker Trike is very stable thanks to its wide base and wide tracking tires, making it a good tool for motion training and physical therapy for special needs riders. The trike features a wide and thickly padded seat and upright handlebars for further rider comfort and stability. With solid disk wheelbarrow-style wheels and large air tires, the WTX WideTracker Trike is designed for controlled environments where short distances are covered and low speed is the order of the day. Recommended for riders 10 and up.